Sometimes it’s not as easy as you might wish to attach a hammock chair with a suspension. And unfortunately, there is no patent recipe that works perfectly everywhere. But don’t worry: in this “How to hang a hammock chair” article we’ll show you the possibilities and the one or other suspension to fix a hanging chair almost anywhere: In wooden ceilings, wooden beams, concrete ceilings, on the terrace, on a tree and of course in hanging chair stands. We’ll introduce you to various accessories and suspensions from brand manufacturers that allow convenient attachment almost anywhere and give you some general tips on how to attach a hammock chair. 3 Where should the hammock chair be fixed? 6 Which suspension is NOT recommended? We at Hängesessel-ABC are not completely unskilled in our craftsmanship, but we are not structural engineers either. The final evaluation whether a construction is really stable should always be carried out by professionals in case of doubt. Particularly when it comes to the stability of ceiling constructions, it must always be decided on a case-by-case basis whether a hanging chair can be attached to the corresponding ceiling. The statements made in this article about the load-bearing capacity of ceilings are merely general empirical values. 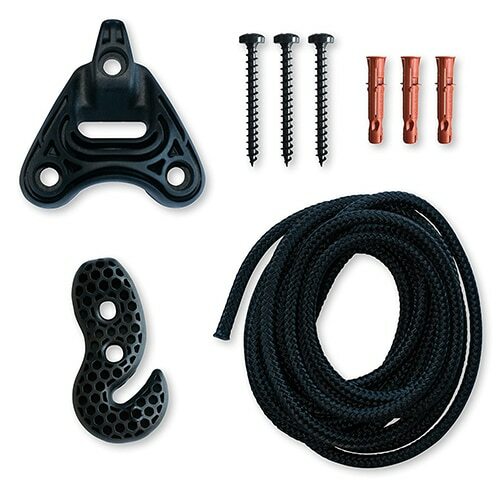 The data on the load-bearing capacity of the suspensions and other accessories are manufacturer data. Where should the hammock chair be fixed? First of all you have to ask yourself the question: Where should the hanging chair be fastened? In the house? In the garden? In the garden? Or outside in summer and inside in winter? Or on the terrace or balcony after all? Generally speaking, the more flexible you want to use your hammock chair, the more worthwhile it is to purchase a hammock chair stand. With this you are on the safe side and can set up your hammock chair where you need it at the moment. If your hammock chair is only to be hung at a single, fixed point, it is of course the easiest (and cheapest). But there can also be pitfalls here if the ceiling is simply not load-bearing. Let’s start by fixing a hammock chair in the house at a fixed point. The first step is to examine the ceiling in the chosen room: What material is it? A wooden beam ceiling (with or without cladding) or a concrete ceiling are rather problem-free here, while the safe suspension on a suspended ceiling with e.g. plasterboard cladding is very difficult or impossible. Anyone who has such a suspended ceiling without a stable substructure will have to grab a hanging chair stand. The suspension on a concrete ceiling of newer houses is rather unproblematic. Here you can usually attach the hammock chair to the entire ceiling area. Concrete ceilings have the advantage that as a rule they can carry sufficient weight at any point – so you are absolutely flexible when choosing the place for your hanging chair. There are various suspensions for fixing in concrete, which we will introduce in more detail below. 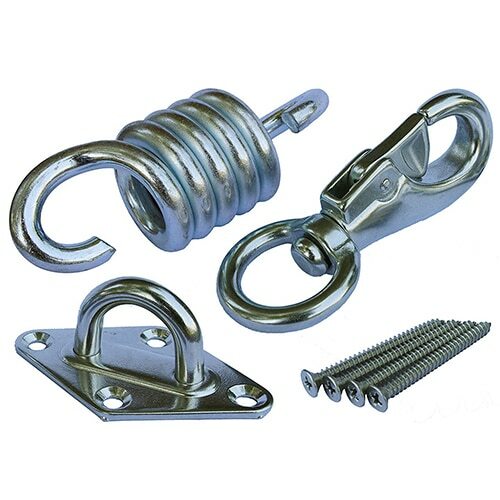 In order to be able to screw the screws of the respective fastenings into the concrete, you need corresponding dowels, which are actually included in every set. 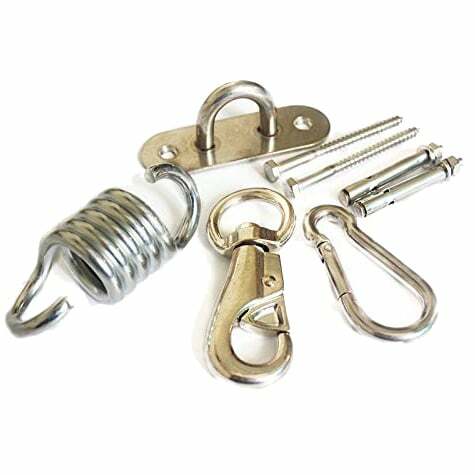 The simplest combination would be an eyebolt with a high-quality dowel fastened in the ceiling, as shown in the picture. To drill a hole in a concrete ceiling, you also need a drilling machine, because you won’t get far with a cordless screwdriver, or the device completely overloaded. Also the attachment in a wooden beam ceiling is relatively easy, but not so flexible. Here it is important that you don’t attach a hammock chair to a board covering, but only to a stable and load-bearing wooden beam. If you have a covered wooden beam ceiling, you must first find a wooden beam underneath it. There are basically three ways to do this: You’ll find someone who knows exactly where the load-bearing beams are, or alternatively have old photos of the building (like us). The second possibility is to invest money in a multi-detector like the Bosch Professional GMS 120*. This multidetector is also suitable as a beam finder with a detection depth of up to 38 mm. The third alternative is suitable for attic apartments in old buildings: There you sometimes have the possibility to find out the position of the beam above the attic. This is seldom the case, but maybe it helps one or the other. That’s exactly what worked in my stepped shack. In summer one would like to fix a hammock chair in the garden. There are two main possibilities besides a suitable frame: The attachment at a stable branch, or at a balcony lying higher. Attaching the hammock chair to a stable branch is as easy as it gets, requires no drilling and costs relatively little. But first you should check if the branch is really stable. Unfortunately we can’t make any statements about the required branch thickness, because it depends on the type and age of the tree. So please check the load-bearing capacity of the branch of your choice carefully beforehand. If you are worried about the load-bearing capacity of the tree, you can either support the tree with a scissors support or divide the weight of the hammock chair evenly over several branches using a clever rope construction. You can now simply throw this noose over the branch and pull the other end of the rope through it. The rope is now attached to the tree and you can attach the hammock chair to it. If you want to attach the hammock chair to a balcony, the first question to be answered is whose balcony it is. Is it your own? No problem, then all you have to do is think about the stability. If the balcony belongs to the neighbor above you, you have to ask him for permission to fix it! It’s a bit more complicated when it comes to stability: it’s hard to make any general statements about the fastening here. In general, however, you should choose the most stable T-beams for steel constructions and a stable beam for wooden balcony constructions. Unfortunately, more exact statements cannot be made here in general. The attachment then works like a branch: Simply throw a corresponding loop over a stable support and pull the other end of the rope through. Which suspension is NOT recommended? What you should absolutely do without are cheap suspensions from the DIY store. Who saves here, pays later possibly with a bruised coccyx and a horror. However, if you know your way around here and buy the right high-quality dowels and screws separately, you will of course also be in good hands in a well-stocked DIY store. Suspending a hammock chair is no witchcraft. With the right suspension it is very easy and safe. Anyone who decides on one of the tested fixings from a brand supplier and does not have two left hands when fixing does not have to worry about stability. 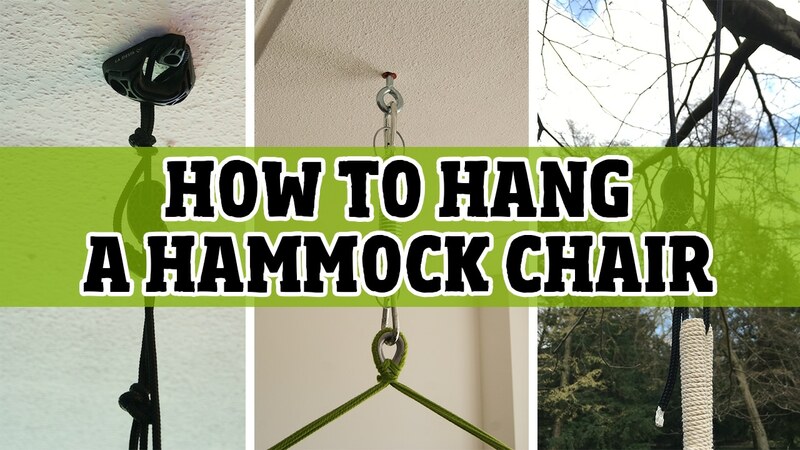 I hope you liked our guide on how to hang a hammock chair. Leave us feedback in the comments. 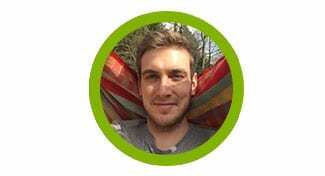 On this website I review hammock chairs and collect information about the topic. Hammockchair.net is the perfect start for your purchase of a new hanging chair for you or as a gift for your loved ones.